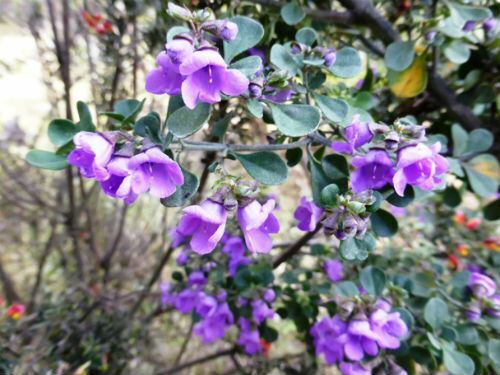 Prostanthera rotundifolia is known as the Round-leaf mint Bush and is well known in cultivation. The Round-leaf Mint Bush reaches a height of two metres in our cold climate garden. As the common name suggests the leaves are round. The foliage is very aromatic. Flowering is in spring when the plants become covered with blooms. The flowers are conspicious and profuse. Usually they are purple but there is also a pink-flowered form. Prune after flowering to maintain a bushy shape. Both foliage and flowers are attractive features. In dry periods plants may sometimes wilt. Judicious watering or a rainfall of about ten millimetres or more will bring plants bouncing back. P. rotundifolia could be cultivated in shrubberies or planted beside a path where as you brush against the plant the perfume is released from the foliage. The species could also be planted under mature eucalypts to create a woodland effect. In these situations, this Mint Bush will light up your woodland in spring. P. rotundifolia occurs in Tasmania, Victoria and New South Wales. There is a form that is found in New England National Park, east of Armidale NSW. This is to be given species status and named P. copelandii after Lachlan Copeland a botanical graduate of the University of New England. Lachlan has done extensive research on the flora of the Northern Tablelands of NSW. The Round-leaf Mint Bush propagates enthusiastically from cuttings.